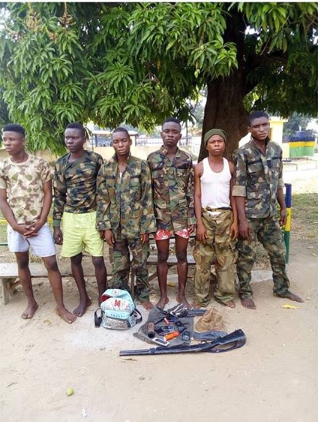 Six members of a 9-man robbery gang have been arrested in Ugbema, Benue State. The suspects were arrested on November 19, 2018. They are identified as: Gang leader Akighir Tyolumun, 18, Iorlumun Kyanya, 18, Chia Joshua, 18, Tevershima Terhemba, 25, Peter Terlumun, 20, and Tarkighir Emmanuel, 18. The suspects confessed to be a gang of nine, terrorising members of the public along Gboko-Ugbema-Katsina Ala axis and dispossessing them of their valuables. Effort is on to arrest the remaining members of the gang.